The Sony Xperia Z1 Compact's layout of controls similar to that of its bigger sibling. You get an RGB notification light on top of the display, alongside the proximity and ambient light sensors and the front-facing camera. The front-facer is a 2.1MP unit, enough resolution for 1080p video. The status LED is hidden inside the earpiece this time around. It's a bit small and, being inside the recessed earpiece, visibility at an angle is worse. Again, we would have liked to see a large strip below the screen - there's plenty of unused space there to begin with, and big RGB strips are both attractive and easy to see as previous Xperia designs have demonstrated. With the area beneath the screen perfectly bare, all the important stuff is on the sides. There is a camera key here, located on the right side, underneath the signature Xperia power key and the volume rocker. Unfortunately, the shutter button, useful as it may be for launching the camera from anywhere, is very tiny and inconvenient. It's better than nothing, but we often resorted to using the on-screen button for actually taking photos. With the back panel fixed, the card slots are located under two flaps on the left of the Xperia Z1 Compact. The microSD goes near the top, underneath the microUSB port, which is covered by a flap of its own. The microSIM slot is further down the same side, after the docking pogo pins. All those flaps are hardly the most convenient solution, but they are necessary for the device to live up to the IP58 dust and water protection rating and certainly improve looks too - too many holes on the side would have looked bad. The top of the phone holds the 3.5mm audio jack that has been left exposed. That's not a cause for concern though as the jack has been waterproofed. The loudspeaker grille at the bottom is pretty large, and in a few minutes we'll see if that translates into actual output - the Xperia Z1 wasn't the loudest handset around, so here's hoping the Compact does better. The back of the phone is one big slab of scratch-resistant plastic. Anyway, the back holds the headline feature of the Sony Xperia Z1 Compact, the 20.7MP camera lens, along with the LED flash. The camera module has a wide 27mm Sony G Lens with a fast F/2.0 aperture and a Sony Exmor RS back-illuminated (BSI) sensor, which is 70% bigger than the majority of smartphone camera sensors. There's also a secondary microphone here - neatly tucked under a small grille at the top of the back panel. 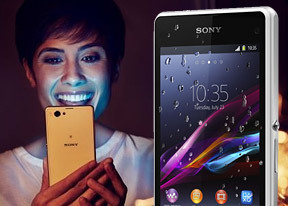 The Sony Xperia Z1 Compact comes with a 4.3" Triluminous display backed up by the company's proprietary X-reality engine. On paper, 720p resolution sounds like a serious step down from the full-HD screen of the regular Z1, but at this size it still results in the more than pleasing 342ppi. So the screen is tack-sharp and you wouldn't really feel any downgrade at all - in fact 1080p would probably have been an overkill at this screen size, and a strain on the battery. The good news is sharpness is not all the Xperia Z1 Compact display has going for it. It also offers excellent contrast with impressively deep blacks, bringing every image to life. Color accuracy is pretty great too and there's even a setting for manually tuning the white balance if you aren't perfectly happy with it. More impressively, Sony has finally managed to get the better of its oldest rival when it comes to smartphone screens - viewing angles. 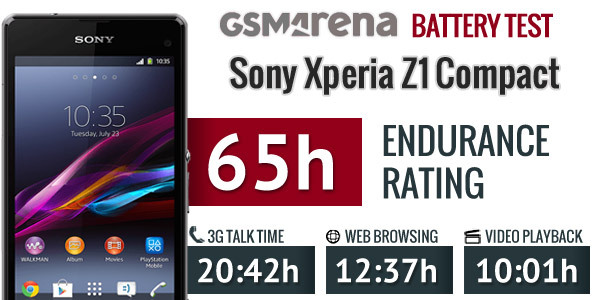 The Xperia Z1 Compact is by far the best performing smartphone in that department to come from the Japanese company. There's only moderate contrast shift when you go to extremes, but everything on the screen remains legible no matter how wide the tilt. Alas, the sunlight legibility isn't as spectacular as the rest of the screen, but it's not too bad either. All in all, the Sony Xperia Z1 Compact display may not look like it on paper, but it actually has the best display we have seen by the company in a while. Granted, the sheer size makes the regular Z1 screen a bit more impressive to look at, but per-inch that's the highest quality the Japanese have delivered. The Sony Xperia Z1 Compact packs a 2,300mAh battery - 700mAh smaller than that of its larger sibling, but it also has a far smaller screen of lesser resolution. So how do those balance out? Quite successfully as it turns out - the Xperia Z1 Compact posted an endurance score of 65h in our dedicated test, faring excellently in the web browsing and video playback tests. It easily bettered the achievement of the full-size Xperia Z1 proving that Sony made the right call going for a 720p screen.